I am in the process of having a friend build my own site. It will start off with pictures of the last operation I went on with the Korean 9th (White Horse) Division in 1971 when I was with 21st TASS. There will be an index that will let readers connect to the other Direct Air Support units I was with, i.e. 19th TASS, 21st TASS, 22nd TASS, 3rd DASF, 4th DASF and the 682nd DASS. All my pictures will be on those sites. Can you download from the site to get what you need. If not, when I finish I will gladly mail you what I have from the 4th, including some newspaper articles if you want them but you have to return them when you finish. Hope this site of mine doesn't take too long. I'm 75 and would like to be around when it is finished. I have been declared 100% disabled and housebound by the VA for the various ailments I have that can be traced to my 32 months in Vietnam but I get around with the aid of a cane and so I can and do get out occasionally. After Jump School A2c Gerald L. Smith and I went to the 4th DASF. Smitty was an old friend from my 1st VN tour in '63-'64. He went to the 1st DASF from the 4th then went to the 1st Air Commando's. We both pulled 5 months during the Pueblo Crisis, he with FROKA and I with the DASC at Uijanbo in '68. While he was with the Commando's I was with the 22nd TASS at Wheeler in '68-'69. Late in '70 I went to the 19th TASS at Bien Hoa where I raised all kinds of hell when I didn't get the jump slot I had been promised. I was the reason 5 jumpers with 19th TASS were transferred to jump slots in other TASS's. I went to the 21st and was assigned as NCOIC of the 5th SF ALO shop in Nha Trang. When SF relocated back to Ft. Bragg I was sent to the 9th ROK ALO shop as NCOIC at Ninh Hoa. Smitty was a ROMAD with the 29th Rgt at Cam Rhan and eventually was pulled up to Ninh Hoa. I had the ALO shop plus the TACP's for the 28th, 29th and 30th rgt's. When I arrived at the 4th in '65 I was assigned to Capt Blatter's TACP. His ROMAD McPherson was pcs'ng out. When Capt Blatter left I was assigned to Capt David Dickinson's TACP (He isn't on your list). Neither is Smitty. Smitty died from a massive heart attack in 2006. He was retired and living in FL. A2c Fernando Rodriguez and A2c Larry Durden came with us from Benning. They were both radio operators, assigned to the 2nd. The Senior Jumper at Osan, a radio maintenance guy who came from CCT was Stephen McCarthy. He was there during the '65-'66 time frame. He left Osan and went to the CCT team at Forbes, AFB in Topeka, KS. He was in the 2nd. During my time at Osan I was "volunteered" to attend the 2nd Inf. Div. recondo school, the 'Imjin Scouts" at Camp Sitman on the DMZ. I have a newspaper clipping of that if you want to copy it. 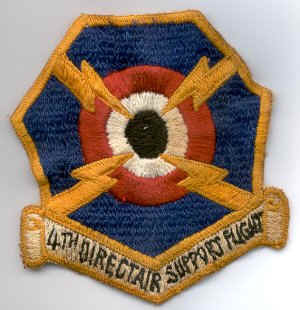 "Volunteered" with me was a member of the 2nd DASF, A3c Richard Gambee. I think he was a radio op but he could have been a rdo mntnc guy. Smitty was paired with Major Graves and they didn't get along. Eventually he was re-paired with a Capt Nasland or Naslund not on your list. The orderly room clerk for the 4th was A1c Garbrecht not on your list. I can't remember his first name. SSgt Adams, listed on the roster as Communications was the Motor Pool S/sgt. for 4th DASF. There was a S/sgt Armstrong in the 4th. He was a mntnc guy. In the 2nd there was an A2c Ludy. Don't remember his AFSC. Also in the 2nd was A2c Elizondo , rdo mntnc. He went into CCT after Osan and I heard he received a Silver Star in VN. I'm not sure but Jim Donaldson would probably know. There was another FAC from the 4th whose name I remembered this a.m. and can't think of now. When it comes back I will let you know. Will send you additional info if and when it comes to me. Hope this helps you out.